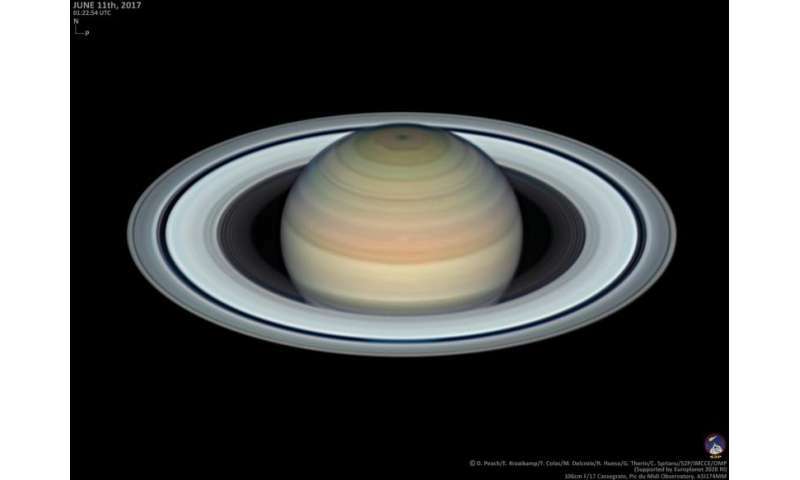 The first observing run of a collaboration between amateur and professional astronomers to monitor our planetary neighbours has resulted in some of the best planetary images ever taken from the ground. The 'Pic-Net' project (http://pic-net.org/) aims to use the one-metre diameter planetary telescope at the Pic du Midi Observatory in the French Pyrenees to monitor the meteorology of planets in our Solar System, measure global winds in their atmospheres, monitor impact of minor planet bodies producing giant fireballs in planetary atmospheres, and provide observational support for various space missions. Last month, a small team of amateur astronomers carried out a pilot observing run during a workshop funded by the Europlanet 2020 Research Infrastructure (RI). 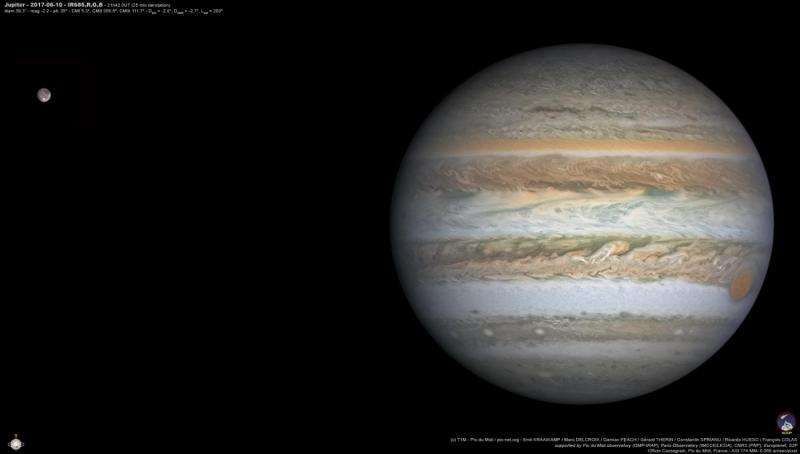 Superb-quality images of Jupiter, Saturn, Venus and Jupiter's moon Ganymede were obtained during four nights of observations, as well as images of Uranus and Neptune. "The key to the success of this project is our highly-experienced team of observers, the optical quality of the telescope, the highly stable atmosphere at the Pic du Midi observatory and cutting-edge instrumentation," said Francois Colas, astronomer at the Institut de Mécanique Céleste et de Calcul des Ephémérides (IMCCE) and telescope and instrumentation lead of the Pic-Net project. "We believe that these are some of the best planetary observations from the ground to date." Repeated observations with ground-based telescopes provide a long-term, global view of planets that can put the detailed, close-up data collected by orbiting space missions into context. Amateur astronomers with relatively small telescopes can make extremely valuable scientific contributions by observing at dates where no equivalent data is available. Several observing runs like those from the Pic-Net pilot are needed over a year to understand the changes in the atmospheres of planets. "Images obtained through Pic-Net can provide valuable, ongoing support for space missions," said Marc Delcroix, an amateur astronomer who has piloted the use of the one-metre diameter telescope and is the organiser of the Europlanet workshop. "For instance, the high quality of Pic-Net observations of Saturn, which show clearly the hexagon feature surrounding the north polar vortex, atmospheric bands and cloud features, will also provide an avenue for continued study of Saturn and build on the legacy of the Cassini mission, which ends in September." Over the last 15 years, amateur astronomers have proven their skills, experience and potential in planetary imaging using new fast cameras that 'freeze' optical distortions introduced by the atmosphere on high-resolution telescopic observations. Professional astronomers collaborate closely with amateurs in many areas of planetary sciences, including the study of the atmospheres of planets like Venus, Jupiter or Saturn. The ultimate goal of the Pic-Net project is to provide experienced observers with more access to the Pic-Midi facility in order to extract the full potential of the telescope and the observing site over time. Regular visits with an enlarged team of observers are envisioned as part of the Pic-Net project. "The Pic-Net programme provides invaluable support for the Juno mission and complements other Earth-based observations from professional astronomers," noted Glenn Orton of Jet Propulsion Laboratory, California Institute of Technology, who is the Juno science team member in charge of coordinating Earth-based observations to extend and enhance the science return from Juno's investigation of Jupiter and its magnetosphere (www.missionjuno.swri.edu/junocam/planning). Orton added, "These observations not only provide details on planetary cloud morphology that are close to what we might expect from the Hubble Space Telescope, but also such a program of regular observing allows us to understand the evolution of intermediate- to small-sized features on a variety of time scales, helping Juno scientists to understand the history of features for which the spacecraft only gets one or two 'snapshots' on each close approach." Javier Peralta, team member of JAXA's Akatsuki mission commented, "In the case of Venus, the amateur observations have experienced incredible steps forward in the last years. Images in ultraviolet and near-infrared wavelengths permit the study of winds at two altitudes of the dayside clouds, even when Venus is close to being at its furthest point from Earth, while smart combinations of infrared filters for nightside observations now allow us to clearly resolve many surface elevations. These are much needed in support of the Akatsuki mission."